MSimps is a Ghanaian owned design house specializing in hand-made customised accessories; Ladies hand bags, clutch purses, tote bags, laptop bags/sleeves, hair and dress brooches and men’s slippers. MSimps’ designs are inspired by African fashion and Ethnic prints especially its colours and patterns. MSimps believe in elegance in simplicity and one unique feature that makes the products stand out is the particular attention they pay to detail. Adu-Amani , manufactures of authentic African indigenous shoes, bags and fashion accessories in Ghana . The brand mission is to interpret the traditional Ghanaian or African identity to the world. The most unique thing about adu- Amani is made in Ghana, which makes the brand proud as well as their clients. High quality, carefully designed products, well packaged and good finishing differentiate the brand from others. Driven by creative imagination, aesthetic design & comfort, Aya Morrison is a clothing line for women who are feminine, statement-makers & uniquely fashion forward. The brand’s aim is to create pieces that go beyond the traditions of women’s fashion and explore more of the imagination that maximizes impact. Good management and dedicated team, allows the brand to achieve customer satisfaction and embrace their mission. 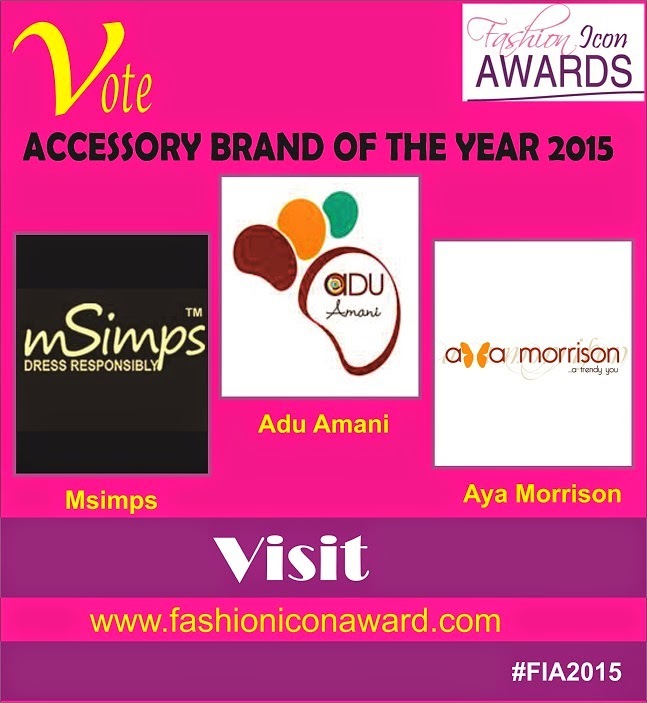 Now that you know the nominees, visit www.fashioniconaward.com to VOTE for you top choice.